Glossybox May 2014: 50 Years of Superdrug. I was am currently very giddy whilst writing this post, with a pack of Oreo's by my side I have never been happier. The news broke out the other week that for May's Glossybox they would be pairing up with Superdrug - who are celebrating their 50th Birthday! 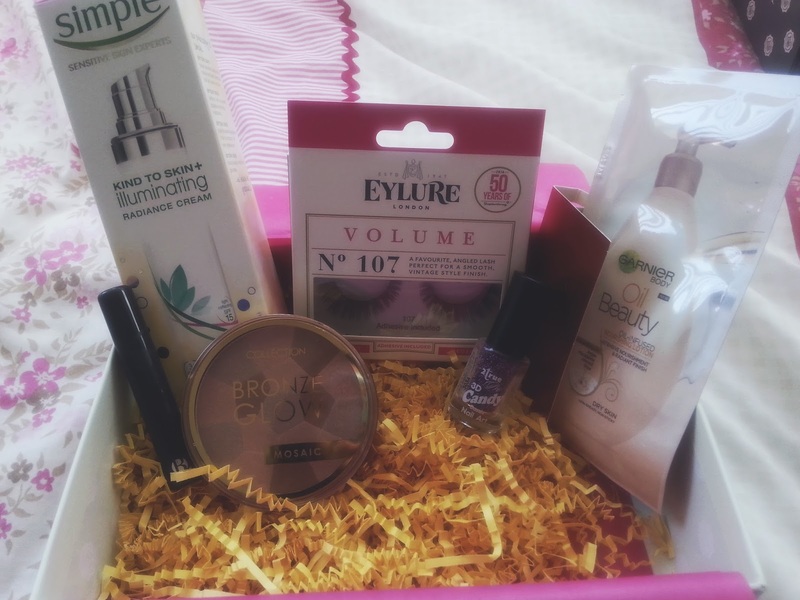 I love Superdrug and have not tried out Glossybox before I thought this would be the perfect chance! I am still in debate whether or not to keep the subscription on or whether to just pay when I like the box that month?! I did only one of Birchbox to test it out..here we go! This box was filled with lots of goodies including samples, and then full sized products! Super impressed! Simple Illuminating Skin Cream -£.8.99 // I was going to buy this cream the other day and I didn't and its a good job I didn't. I am so excited to try this and will have a full review soon, because I practically love anything from Simple! Eylure Lashes - £5.35 // I am not the biggest fan of false lashes and don't wear them and probably never will because I am very scared but I will give these to someone who will most probably wear them. 2True 3D Nail Candy - £ 3.00 // This was an unusual thing to get in the box but I am excited to use, these are like the Ciate beads they bought out a while back and was a big summer trend! I like 2True as a brand - cheap, affordable and most of the time good quality. Collection Bronzer Glow Mosaic - £2.99 // The search for a new bronzer ends here! I have been on a search for weeks to find a new bronzer that I can wear in the summer that's not too muddy and awful on someone with dark skin. I never even thought of looking at Collection and Hey Presto! My wishes were granted! B. Sheer Conditioning Lipstick in Petal - £6.99 (on offer for £3.49) // New brand to me but fairly old in Superdrug. This brand has a lot of things on offer and my local Superdrug doesn't stock B. which is a shame because this lipstick is really nice. I love the colour for everyday and something to throw on in a hurry. Ghost Eclipse & Garnier Oil Infused Lotion Samples // These are bonus samples and I think they add a cute touch to the box, the perfume smells summery and the oil sounds really interesting. Overall - REALLY REALLY IMPRESSED! I am quite surprised that this box was as good as it sounds, I will see whether Glossybox deserves to be subscribed to for another month, will have to wait and see! Total of this Box - Over £27 which is nearly at £30 but I bought it for £10! Wow!